It's no big news that sitting is bad for you. I've heard this for years, and I'm sure you have, too. Study after study has shown that sitting leads to higher rates of back pain, diabetes, mental illness, disability, high blood pressure, bad cholesterol, excess belly fat, obesity, heart attacks, heart disease, cancer and just plain death. Yes, really... death is on the list for "dangers of sitting." See this WebMD article if you don't believe me. While all of that is adequately unpleasant, what really shocked me was a recent study reported in Runners World magazine. Just released last month, this study shows that every hour spent sitting negates a whopping 8% of the health benefits from an hour of running! According to a research team from the University of Texas Southwest Medical Center, each time unit of sitting cancels out 8 percent of your gain from the same amount of running. In other words, if you run for an hour in the morning, and then sit for 10 hours during the day, you lose roughly 80 percent of the health benefit from your morning workout. People who engage in an hour of moderate-intensity exercise–running is considered vigorous exercise–fare much worse. They lose 16 percent of their workout gain from each hour of sitting." 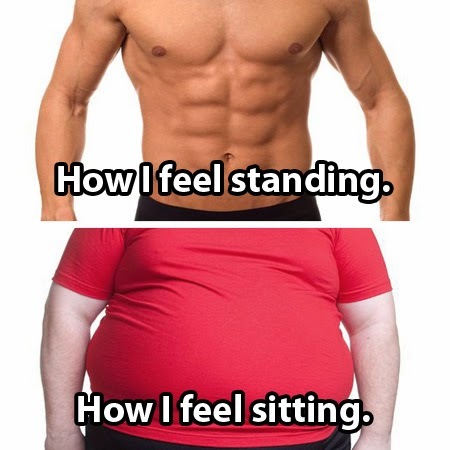 Let's face it, there's just nothing good about sitting. It isn't even excessive sitting, it's sitting for any amount of time that seems to cause problems. 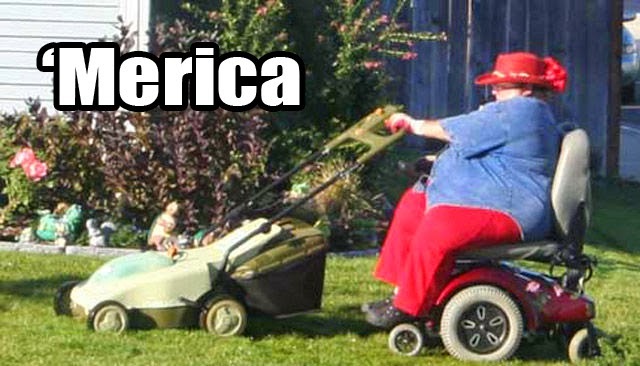 And sitting is one of America's favorite pastimes. This makes me so sad I just want to go plop down on a couch for the rest of the day. Well, I for one do not want to give up my hard-earned running benefits so easily. 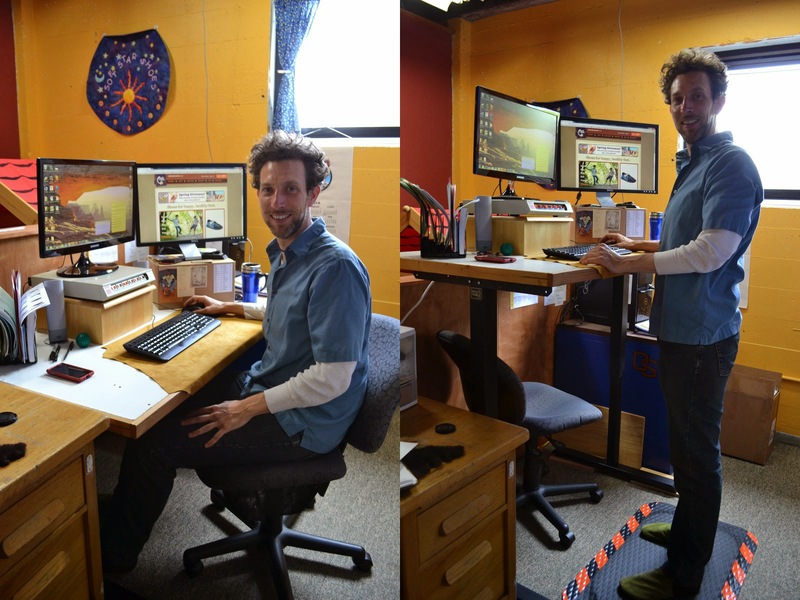 I'm happy to say that I have fully transitioned to a standing desk for my day job. This change actually happened last year, and back pain was the main culprit. No matter how much I tried to tweak the ergonomics of my desk and chair, nagging stiffness and pain in my lower back and shoulders kept sneaking up on me. At the same time, I came across articles discussing how sitting for long periods can lead to tight and/or weak leg muscles that may result in running injuries (later verified by my docs when I developed knee pain). I finally decided to take the plunge and ask my boss if it was okay for me to convert my desk to a stand-up station. All I had in mind was finding a big box to raise my computer screen and keyboard, To my surprise, she not only loved the idea, but offered to buy me a whole new desk that can easily move up and down! I let her know I didn't want the company spending a lot of money on me when a box would have made me happy, but she had a good argument: Soft Star spends a lot on nice ergonomic chairs for our seamstresses to keep them comfortable and healthy during the work day. She said it's also a preventative issue because they would lose labor and workman's comp fees if anyone injured their back on the job. They never spent that money buying a chair for me (which I didn't realize), so they may as well spend it on a desk. She assured me it was well worth the expense to them if it would benefit my health and level of comfort at work. She also insisted on a convertible station because she assured me I would want to take sitting breaks from time to time, at least at first. Yeah, I have an awesome boss and an awesome job. 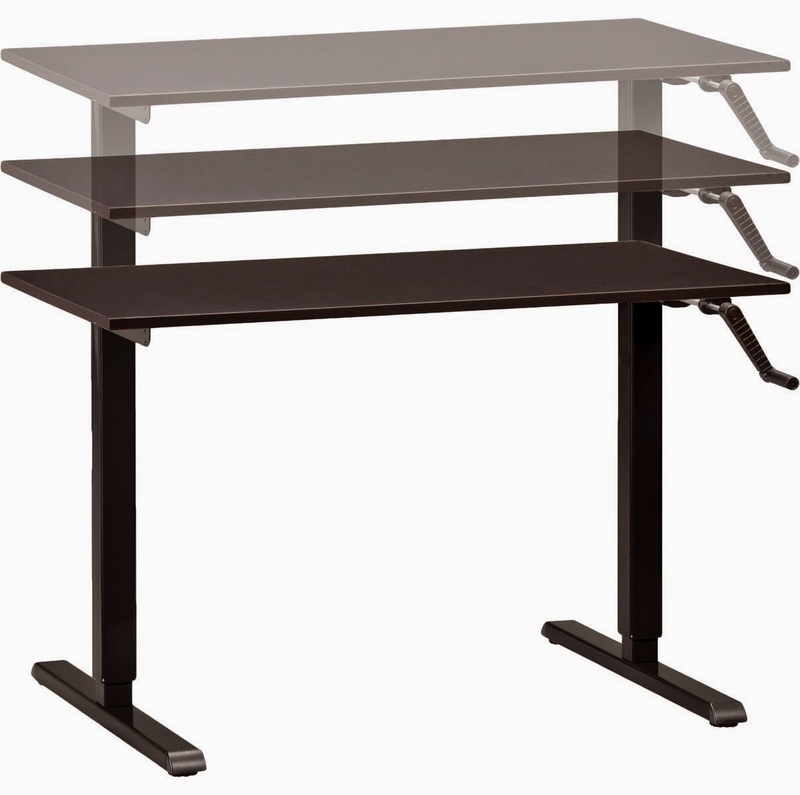 The ModTable adjustable standing/sitting desk. She also took on the shopping search herself and eventually found this beauty. It's made by ModTable and comes with an easy hand crank to switch between standing and sitting positions. We opted for just the base since it was cheaper and we already have an excess of wood around the shop... plus Tim. Soft Star founder Tim Oliver was a carpenter before he started making shoes and he gets really excited for any opportunity to build something out of wood for the shop, so he jumped right on making me a top for the base. In the end, my boss was absolutely right about needing those sitting breaks. I was so excited to start standing my first day and thought I would last the whole eight hours. 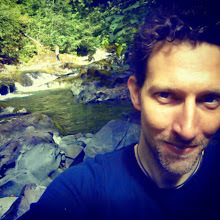 About three hours later I collapsed into my chair and it felt like a glass of water after crawling through the desert. Desk goes up, desk goes down. My chair fits nicely underneath it. The standing time gradually increased over the next several weeks, and I noticed how other events affected it. For example, I was still training for my marathon back then and if I did a long morning run then I'd have little energy to stand through the afternoon. Also, if I didn't sleep well the night before then sitting was much more appealing. I already knew it helps to keep your knees bent ever so slightly, as opposed to locking the legs, when standing for long periods—a big reason people faint at weddings. I didn't notice it for a while, but after several weeks I realized I was routinely standing all day and not using the sitting position at all. I haven't sat at my desk for a long time now and my legs don't feel tired like they used to, even after a long day. I do notice that I'm generally more exhausted after work than I used to be, but I think it's well worth it. My back problems are gone and my legs feel stronger and more flexible than they did even a few months ago. My latest renovation was the addition of a resistance band around the base and block of wood on the floor. When I started physical therapy last spring my PT suggested doing hamstring curls and calf raises a couple times each day, along with mild stretching. Now I can do them while I work! I was discharged from physical therapy weeks ago, but I see no reason to stop. After all, Dr. Nick recommends 100 calf raises daily for runners, and they do make computer work more enjoyable. Glad to hear it, Alaina! Hope I didn't scare you too much. This is a great blog. I totally agree the reasons you have given for quitting long hour sitting. I will definitely follow the suggestions given by you in your infographics. And I think these are very useful since I have a sitting job and I have to sit for more than 8 hours a day. The major thing is that I am experiencing neck and back pain including fat stomach. I hope your suggestions will help me in keep my body health and fit. Thanks Trevor. Best of luck on your transition!